About N121 billion has been spent by Dangote Sugar Refinery Plc on equipment, land acquisition, compensation to land owners, consultancy and related services in its backward integration project. 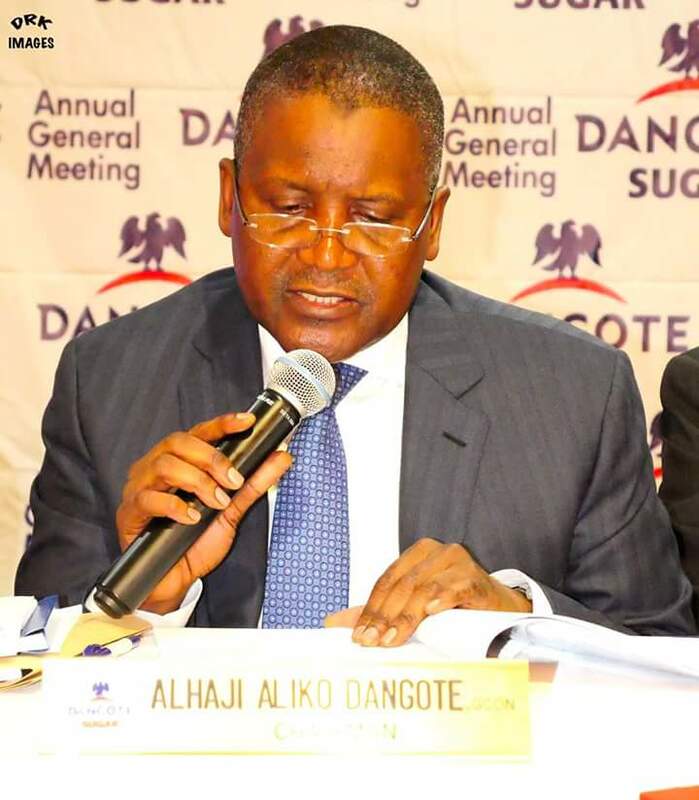 Chairman of the sugar refiner, Mr Aliko Dangote, gave out this information at the company’s Annual General Meeting (AGM) held in Lagos last week. According to Mr Dangote, the major setbacks were flood, community relation issues and most recently clashes between host communities and herdsmen. However, he said the firm would continue to give shareholders value for their investment. He said in the 2017 financial year, the company increased its dividend payout by 192 percent or N1.75k per share from N7.2 billion or 60k paid in 2016 to N21 billion. “The board of the company has recommended to shareholders for approval, at this meeting, the payment of a final dividend of N15 billion, being 125 kobo for the year ended Dec. 31, 2017. “The board had earlier approved the payment of an interim dividend of N6 billion, being 50 kobo per share, which brought the total dividend for the year under review to N21 billion,” the Africa’s richest man said at the yearly meeting. Mr Dangote said the hike was in line with the company’s resolution to deliver enhanced returns on investments to stakeholders. He explained that the company forged stronger to achieve a group turnover of N204.4 billion, 20.4 percent increase over N169.7 billion recorded in the comparative period in 2016. He noted that the company posted a profit before tax of N53.6 billion during the period under review, compared with N19.6 billion achieved in 2016, an increase of 173 percent, adding that profit after tax rose by 176 percent to N39.8 billion against N14.4 billion achieved in the comparative period of 2016. On his part, acting Managing Director/CEO of Dangote Sugar, Mr Abdulahi Sule, said the company will continue to leverage on its strengths to maximise every opportunity to generate sales, increase its market share and create sustainable value for stakeholders. “Our priority in the current year is the achievement of our Sugar for Nigeria Project goals and sustenance of our leadership position by improving efficiency and growing our markets,” Mr Sule assured shareholders at the meeting. He also assured the Dangote Sugar would continue to pursue its target to achieve 1.08 million tonnes of refined sugar annually in six years and 1.5 million tonnes in 10 years. “Though the business terrain remains challenging, we remain resilient in the face of the situation and we are focused on increasing our market share and customer base, as well as the creation of sustainable value for our stakeholders,” he said.